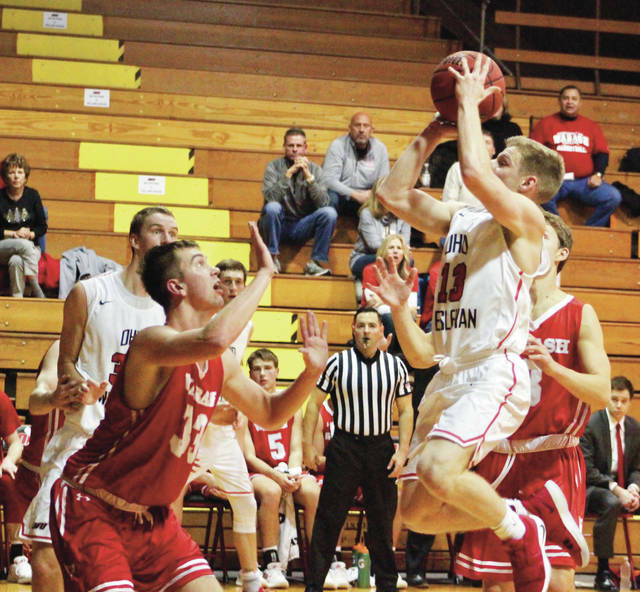 DELAWARE — The Ohio Wesleyan men’s basketball team couldn’t overcome a second-half drought of just over four minutes, falling 76-67 to Wabash in NCAC play Wednesday night at Branch Rickey Arena. The Little Giants snapped a six-game losing streak to OWU with the win. The Battling Bishops held the top two Wabash scorers, Jack Davidson (22.0 points per game) and Connor Rotterman (11.8), to four points for the better part of 30 minutes. Davidson, who led the NCAC in scoring coming into Wednesday’s contest, buried a three-pointer to tie it 52-52 with 10:25 left in the game. Davidson and Kellen Schreiber had 15 points apiece and Harrison Hallstrom added 14 to lead the Little Giants (6-0, 2-0). Hallstrom also led with nine rebounds and Ben Stachowski added eight. Davidson had five assists to lead the way. Alex Eberhard’s three with 8:45 left gave Wabash the lead for good. It came as a part of a 19-2 second-half run to push the lead as high 11. Rotterman scored all of his nine points in the last seven and half minutes of the game. OWU came back strong, closing the gap to 68-65 on a Jaret Gerber three-pointer with 2:20 remaining. But Davidson put it out of reach with his second three with a little over a minute left to end the threat. The Bishops held Davidson scoreless until he knocked down a basket in the lane with 41 seconds left in the first half. Colten Garland knocked down a three-pointer with 1:16 left in the half to start a 7-0 run for the Little Giants. Grant Gossard found Nick Carlson underneath for two to finish out the scoring for the half with the Bishops trailing 34-32. OWU struggled shooting all night, but particularly in the first half when it shot 33.3 percent from the field and made just five of 17 from behind the arc. The Bishops shot 36.4 percent from the floor, including 10-for-36 from three, for the game. OWU went on an 8-0 run early in the second half on the strength of back-to-back threes by Carlson and Gerber to take the lead. Gossard buried a three with 14:24 left. Ethan Stanislawski had 16 points, Gossard added 14 points and a game-high 14 rebounds and Carlson chipped in 13 points to lead the Bishops (4-3, 1-1). Next up, OWU continues conference play with a trip to Hiram, which is scheduled to start Saturday at 3 p.m.